It’s been quite a while since Runic Games have been in the spotlight. Torchlight II released over a half-decade ago – you may recall it stealing some of Diablo 3’s thunder – but they’ve been pretty quiet since announcing their next title in 2015. Well, that new game is finally here, with the Zelda-like Hob making its gorgeous debut today. Dig into the best indie games on PC. 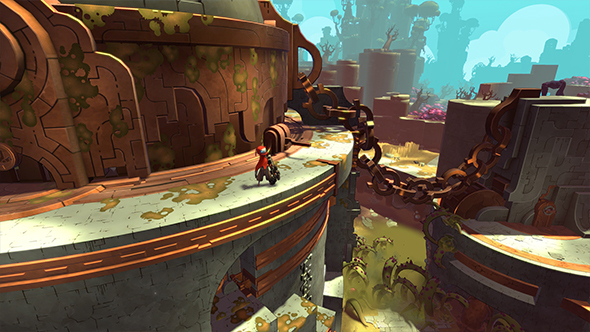 Hob is a dialog-free adventure revealed by exploration and interaction with the strange world you’re a part of. The planet itself changes shape based on the puzzles you solve, opening new areas to explore and secrets to find. Most of your interaction is driven by a mechanical glove that lets you grapple and warp around the environments, as well as delivering good ol’ socks to the jaws of various monsters. There are swords and stuff too, so combat isn’t all punchy. There are also pretty gruesome deaths amid all the pretty visuals, so look out for that. Hob is available for $19.99 / £14.99 / €19.99 on Steam, GOG, and the Humble Store. Runic “strongly recommend” a controller to play, so dig out the gamepad before you dig in.